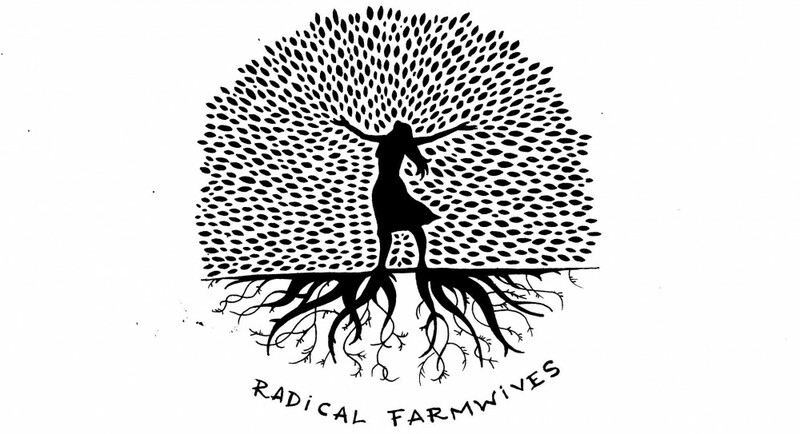 sometimes, every so often, this homesteading, home educating, total immersion family life dance we do flows so perfectly. other days it can be awkward: emotions and agendas crashing about recklessly. it all makes sense though in those moments of perfection, perhaps rare, but so flawless that it keeps me going. our family of five, each one of us, without a doubt agree, perfection was achieved with the chess set. this love imbued, home crafted, deeply adored and just barely finished, Egyptian themed, chess set. 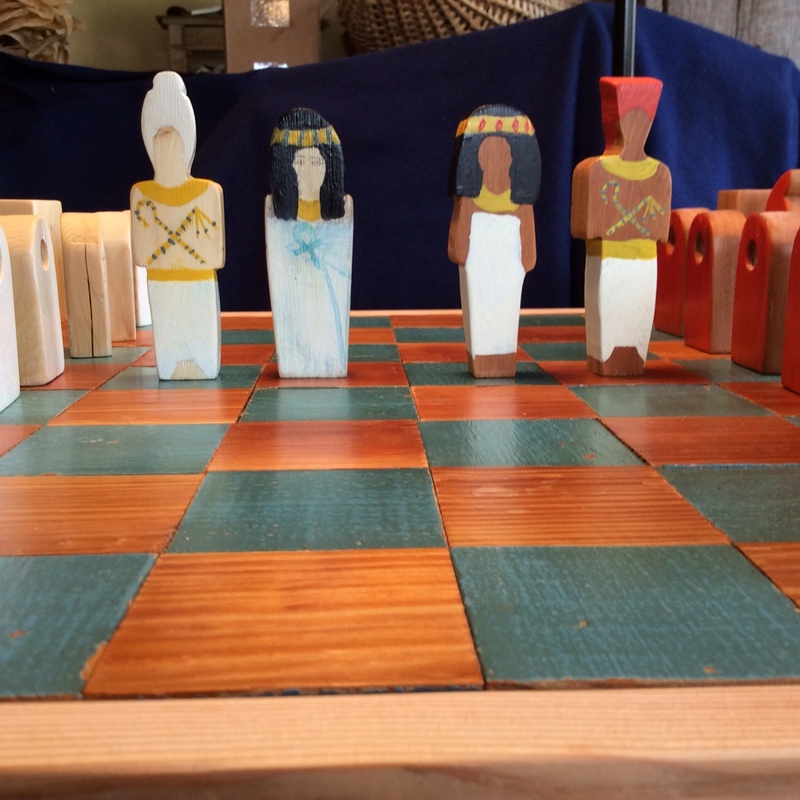 this wooden board and her 32 pieces brought together my daughter’s near obsessive adoration of ancient Egypt, her dear father’s love of woodworking, a familial commitment to recycling and re purposing wood, and all the joy that comes when a family works and plays together. 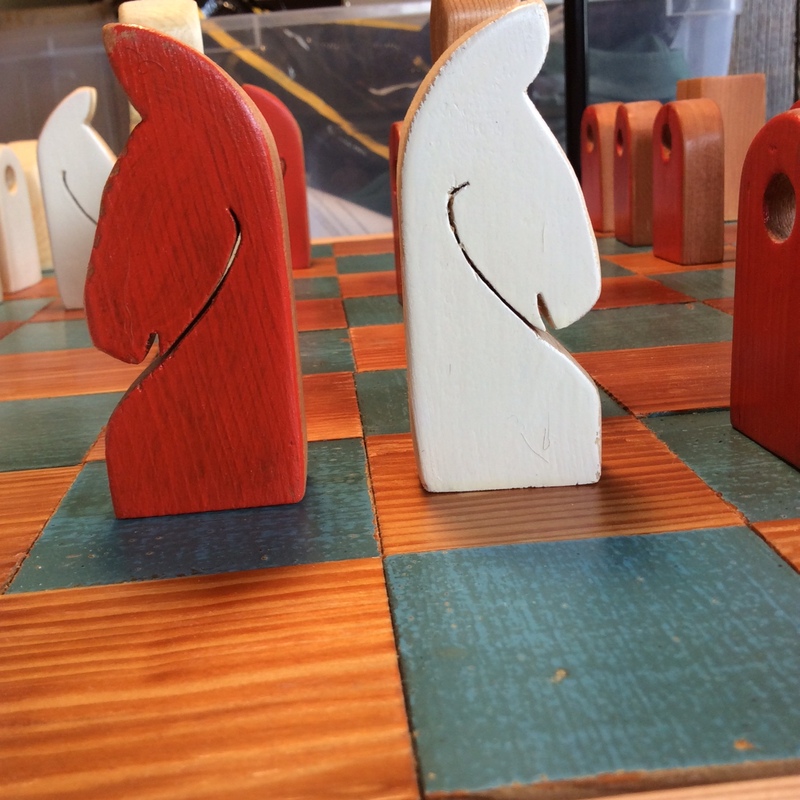 this chess board embodies everything that is good about living, working and learning in our intimate, often unusual, way. the wood is all salvaged from our deconstruction at the farm stay. the concept is the result of endless hours of enjoyable study of upper and lower Egypt. the game itself is dad’s favorite. 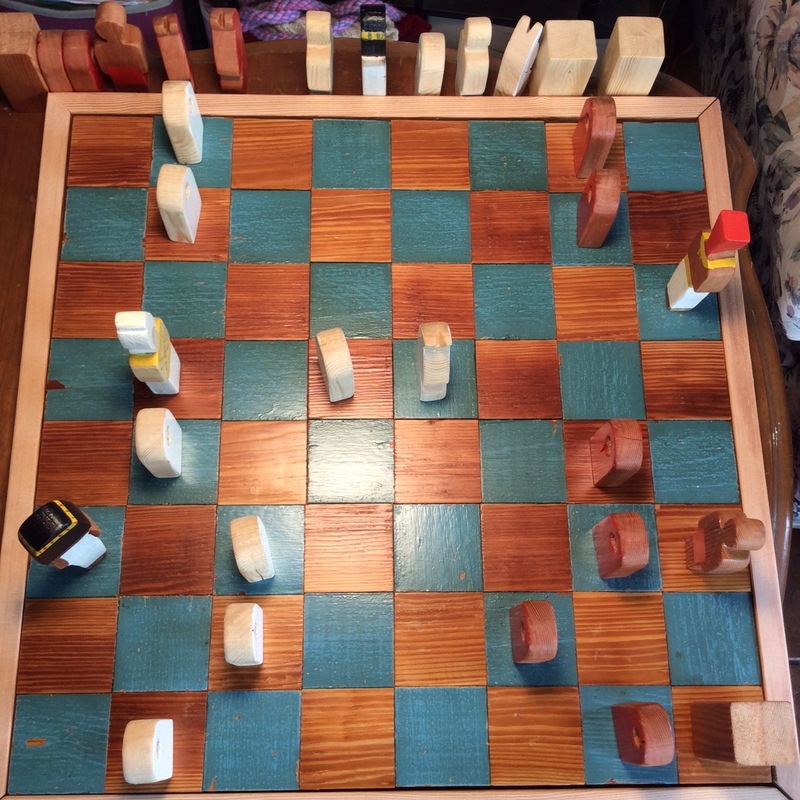 in an all out effort to entice the family into chess game after chess game after chess game, father and daughter carved, sanded, painted and created this set in many a late night session. we can’t keep our hands off it. each quiet moment, whether it be dawn or dusk or sometime in between, you can find father and son, mother and daughter, brother and sister, husband and wife challenging the other to a game. the response, at least for now anyway, is ALWAYS a resounding yes! 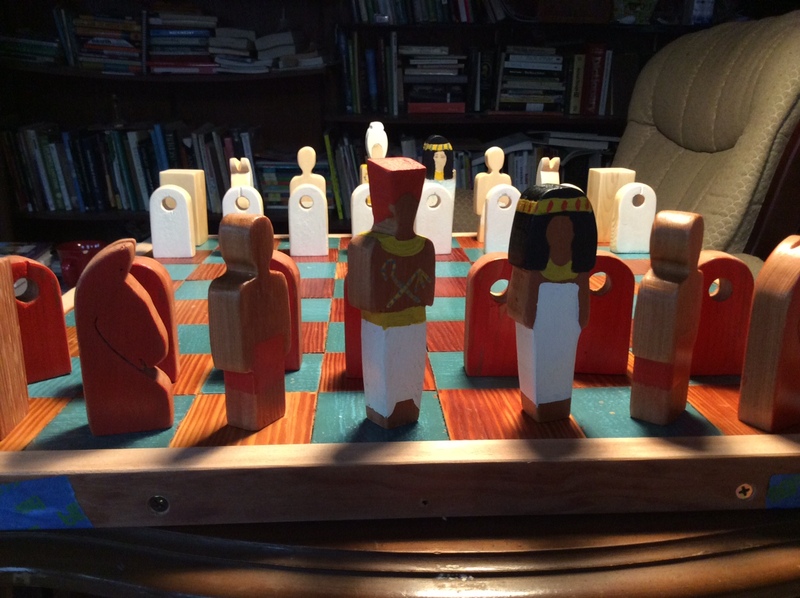 This entry was posted in robin's posts and tagged chess, Egypt, hand made, wooden toys, woodworking by robin. Bookmark the permalink. I was obsessed with ancient Egypt too when I was M’s age. I thought it was because I really liked cats but maybe it is a girl thing! ready for a chess game next visit? What a great chess set, and what a great origin story. Congrats! thanks for reading and commenting. such a fun story to share. Great chess set! Bet it was fun doing all the research and then translating to pieces on the board. it was such fun, we were all so engaged in the project, start to finish. Maybe it’s just the day or something, but the thought of the birth of such a family treasure nearly brought me to tears! Happy playing!